↑ Accumulated $4,000 USD as part of my annual saving goal for August. ↑ Dividends Emerging markets sovereign bond (IEMB ) – 101 USD or 4.6% annually. - I just noticed that 24 months and about $100K invested my networth is still the same as back in August 2014. I am very lucky to be young and having a good job. In any other case that would be a disastrous outcome. 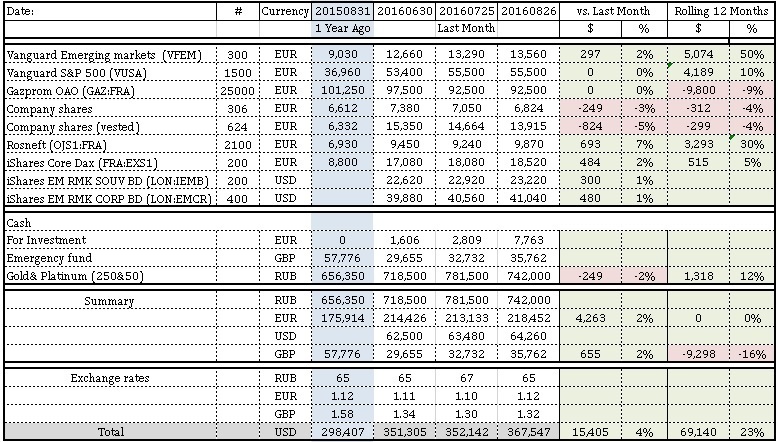 This primarily due to sharp decline in Gazprom shares ~$55K USD and EUR exchange rate collapse to USD ~ $40 K USD. This is another reminder that unless you are rich, you need to minimize the risks and save in the currency you are going to spend the money. Admittedly I am sitting less in cash than in 2014 and dividends are going to be ~$10K USD vs. $7.5 K USD (2014) annually. My plan is to be 100% stocks and bonds by end of the year. - Dividends this year so far are $7,780 USD which is close to my target of $8 K USD. I expect it to be around $10 K USD by end of the year, even having 15% of nest egg in cash. - - Energycompanies are under a lot of pressure. Major players cannot afford their dividends (even 2% ExxonMobil is paying). Some of the biggest companies — such as BP and Shell — still need to sell off parts of their businesses, and perhaps borrow a bit more, to pay dividends. So the big producers cannot maintain their dividends if oil prices do not go up. In order to pay a dividend, the largest oil producers need oil at $63 just to cover dividends and investment with cash flow. This is likely to be the end of the remaining four majors keep paying the dividends. They became too inefficient and expensive.